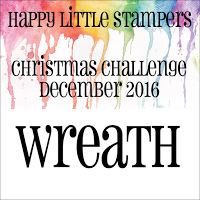 Time to play the last Happy Little Stampers Christmas Challenge of 2016 where the theme is WREATH. These days, I am consciously trying to dig way deep into my stash and fish out things that I have never, rarely, or can't remember when or if I used, and combine the old and the new. This card really is a perfect example of combining old things barely or never used, and new things. OLD: Wreath Wood Mounted Stamp by Inkadinkado. White Flower Soft (Snow), Glossy Accents, Hero Arts Tiny red rhinestones. NEW: Happy Little Stampers Christmas Joy Stamp Set, Zig Clean Color Real Brush Markers, Tim Holtz Brushed Pewter Distress Mica Spray, Silver Wink Of Stella. Please put on some Christmas Music, head on over to the Happy Little Stampers December Christmas Challenge, check out the fabulous inspiration the Design Team has for you and play with us! Link up for a chance to win $15.00 to spend in the Happy Little Stampers Shop. A beautiful wreath, especially the use of the flower soft for the snow - a great finishing touch! 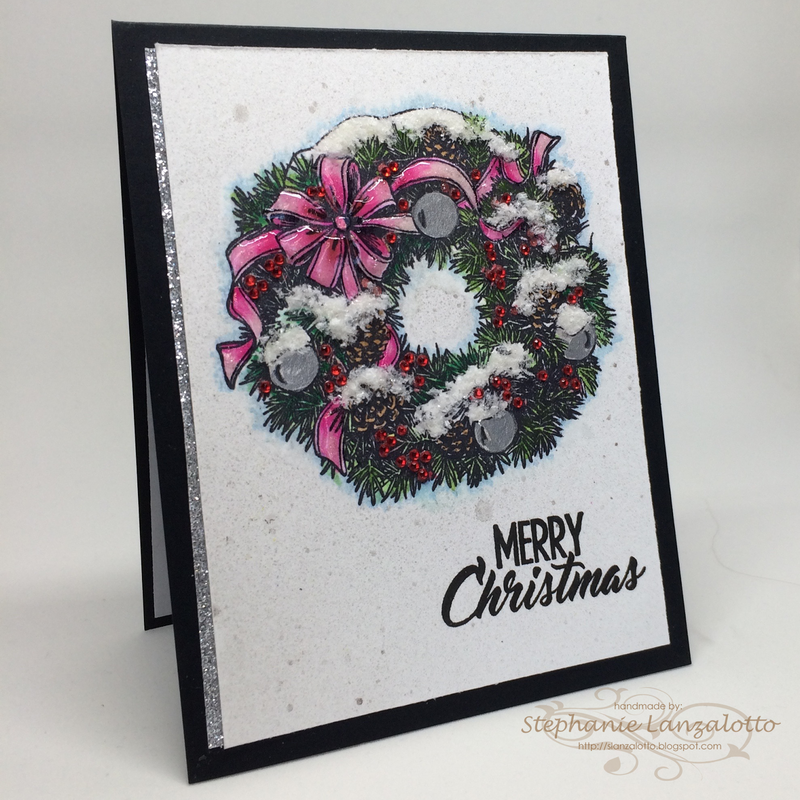 What a gorgeous card Stephanie! I love your beautiful snowy wreath and the strip of silver really adds some shine. I so agree with you about trying to mix the old with the new - it has to be on my crafty resolutions list for next year! You know I ought to do more of this digging into my stash and combining old and new. Your card is a delight Stephanie. Absolutely drop dead gorgeous, and I love that you are combining old and new supplies. I was going to bring out all the old stuff this season, but I forgot to do it in the mad rush to buy all new stuff. Drat! This is so beautiful! Great colouring too! What a beautiful wreath ..... very festive.